A device uses a gestural-based interface to move paralyzed legs. We’ve seen all sorts of high-tech wheelchairs that increase mobility options for people living with paralysis. 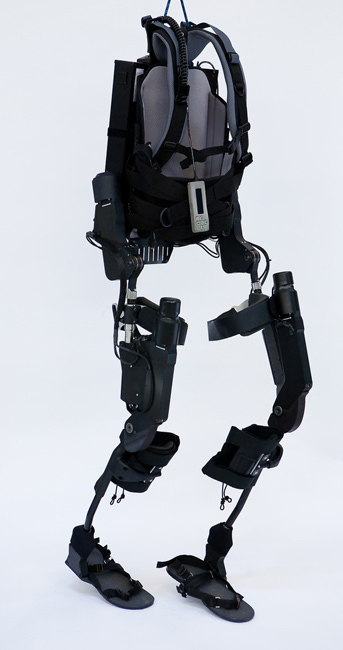 But how about a new pair of bionic legs that actually helps people walk again? eLEGS was unveiled last week by Berkeley Bionics as an artificially intelligent, battery-powered device that uses a gestural-based interface to allow paraplegics to walk. This means sensors embedded in the braces that fit around a person’s body respond to real muscular input from the human powering the eLEGS. As you can see from the video, a woman who normally uses a wheelchair can use the device to stand up and walk in a straight line. Although most users need to use crutches or a walker at first to help guide them back into a normal gait, eventually some people can walk unassisted. 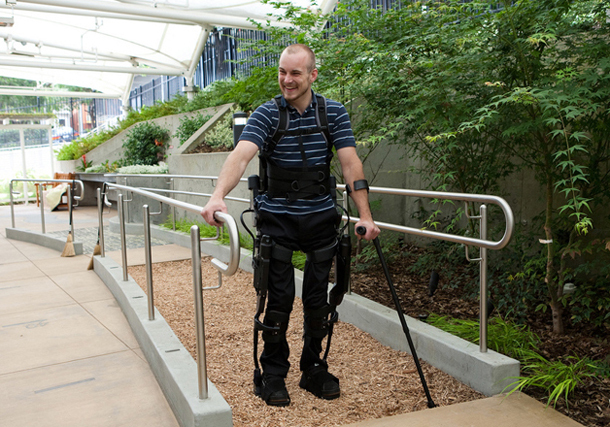 Besides the obvious feelings of freedom and independence that come from walking on their own, paraplegics can see major health benefits just from standing and walking for short periods of time. This “exoskeleton” is a similar concept to Berkeley Bionics’s Human Universal Load Carrier, a device that fits over a soldier’s legs and torso and gives him superhuman strength when it comes to lifting and carrying equipment. While those devices are made exclusively for the military, eLEGS will cost around $100,000 for medical professionals, and could be available commercially by 2013. The plan is for the legs to be initially tested under medical supervision in rehab situations over the next year. But eventually, eLEGS should be able to be used independently by people for an entire day (the current lithium-ion battery lasts about six hours). The implements use thick Velcro and backpack-like straps so they’re easy for a person who uses a wheelchair to put on himself. And although it looks bulky, the whole device is made from carbon fiber and steel and only weighs 45 pounds.